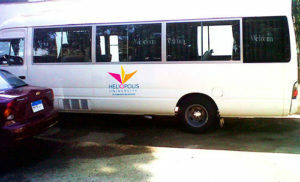 For their safety and comfort, Heliopolis University offers a reliable and efficient bus service for its students and staff members. Our fleet of air-conditioned buses has over 15 different routes that serve three governorates: Cairo, Sharqia, and Ismailia. We continuously expand our service with growing ridership. For more information about the routs and meeting points, please visit our Students Services Office at the Students Affairs Building or call Mr. Ahmed Nassar 01200540062.